MailUp includes email automation tools that allow you to send triggered messages when certain conditions occur. Developing customer relationships by notifying customers of specials, promotions, etc. Since through the MailUp Extension for Magento key data is transferred regularly from your Magento-powered store to your MailUp account, you can leverage that data to send automated, targeted message to your customers. You could isolate customers that have purchased over $100 and whose latest order was 30 days ago. You can then have MailUp check for all recipients for whom these conditions are true (e.g. once a day), and send a specific message to them. You can make your triggered messages even more effective by adding dynamic product recommendations to them. We partnered with 4-Tell to make this quick and easy for you. The folks at 4-Tell use proprietary technology to extract and analyze data directly from your Magento store (both real time and historical data), and use it to feed dynamic product recommendations into your MailUp-powered email messages. Merchants using their recommendation engine are reporting an average sales increase of around 17%. We don't make any money on the 4-Tell integration: we're talking about it here just because we think that it's a cool system, integrates well with MailUp, and can really help you be more successful! 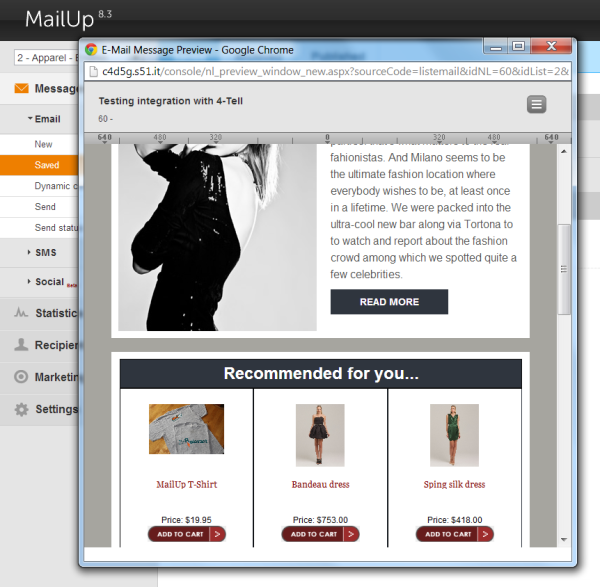 Back to an overview of the MailUp Extension for Magento.